Charming Cabin on forested lot with quick access to the Parks highway on private 11 acres. Come and see what Alaska is all about and experience Denali National Park and the Alaskan Interior! Electricity with heat provided, no need to start your own fire to keep warm on our sometimes cool summer nights! Full kitchen setup with pots and pans, dishes, a coffee maker, refrigerator, microwave, gas stove and oven. Outside is a picnic table, fire ring and BBQ grill to enjoy. This dry cabin has everything a frontiersman could want to feel comfortable in this majestic land. There is an outhouse onsite but NO running water! Water will be provided to wash hands and dishes. If you want to experience how true Alaskans live, this is the perfect place for you! A cold complimentary breakfast is also included! 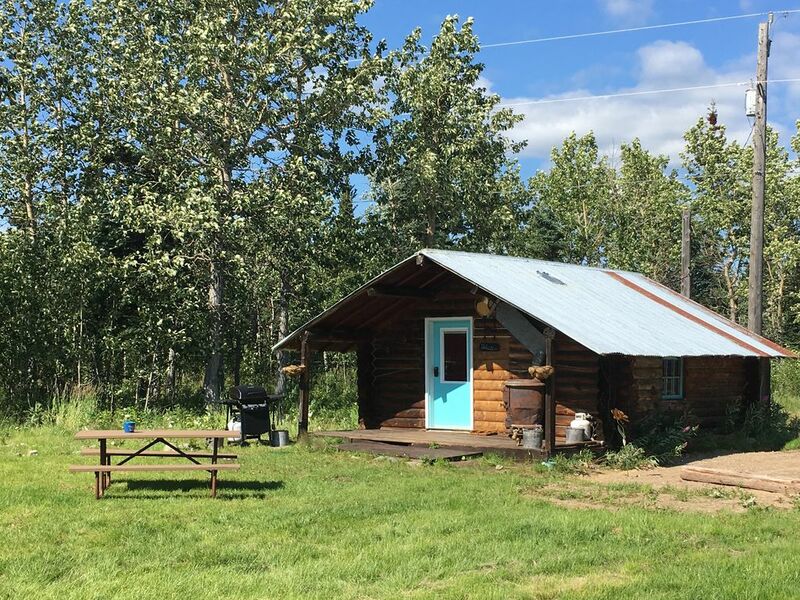 An outdoorsmans paradise surrounds the cabin with Denali NP, rafting, four wheeler adventures, ziplining, golfing and air tours all less than 13 scenic miles away. It is possible to take showers and do a load of laundry at the nearby gas station. Put up your feet, relax and enjoy the quietness and the fresh air of beautiful Alaska in this authentic cabin! This dry cabin is a fun experience and we loved the convenience of being just 15-20 mins from Denali National Park and away from the crowds. Be sure to bring your drinking water and a little extra water for personal needs. We enjoyed sitting on the porch each night looking at the mountains and watching the bunnies in the meadow. We cooked our meals at the cabin (seriously, we had coconut shrimp one night!). We hiked Denali and enjoyed visiting Black Bear Coffee shop in Denali as a special treat. The cabin is cute and the owners graciously provided fruit, yogurt, and bagels and milk along w several other items. We recommend this place as a great base for your Denali trip! What a treasure and a true Alaskan adventure. This dry cabin really gives you the Alaskan experience but with added comfort of a kitchenette and heat. If the weather was nicer we would have loved to sit on the porch and have a campfire outside. Enjoyed having our own space in this area of high tourism. This recently restored cabin was a delight to return to after spending time in Denali National Park. It was easy to find even in the dark. Very clean inside, warm and welcoming. Rich and Darja were very accommodating and we would definitely want to stay here again if we were to return to the area. We really enjoyed our staying, although we were a bit worried because this is a dry cabin (i.e. no running water) this was not something that bothered us so much eventually. Rick and Darja left us some goodies for breakfast (fruit, bread, bagels, granola and more!). The cabin was clean and comfortable - equipped with stove, gas BBQ grill and cooking instruments - which we used to make our meals. LOVED this cabin! It's so peaceful and cute! We totally felt secluded and cozy. We would recommend it to anyone. Just a 15-20 minute drive to Denali. My wife and I loved this cabin,we stayed at 3 cabins during our Alaskan Honeymoon/Adventure and this was by far the Nicest,cleanest and most importantly Private cabin that we stayed at.